The fast one is my favorite, especially after the ten second mark when the little containers look they are dancing on the tray. But the slow one? Yeah, I get choked up a couple minutes in… what a year 2010 was! Which video is your favorite? 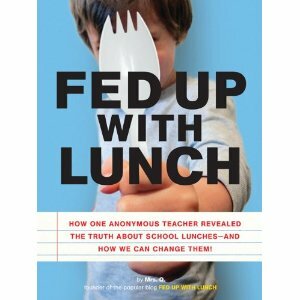 Comment below telling me which video is your favorite and why to be entered into a giveaway of my book “Fed Up With Lunch.” Winner to be announced next week! Previous Post5 benefits to school lunch technologyNext PostAmerica’s Lesson Plan: Pizza is a Veggie! The slower one. I get to savor the awfulness of the food and really study it! The slower video is my favorite, but that’s just because the fast one makes me a little dizzy. Also, since you’ve posted it on youtube, it’s easier for new people to really take in the problems – it makes me a little sick to see every packaged meal go by. I work in a dining center on the university level and understand more than I ever would have before why quick meals seem necessary for schools, especially ones that are probably low on funds just to pay teachers, let alone cooks. But the line has to be drawn somewhere. I prefer the fast one, because you were right; the containers are dancing. Seems like there was a lot of pizza! The fast one! To me, the music synced up better and I liked how the food seemed to be dancing (like you said) in a spinning motion. I wanted to speed to slow one up, the music was too fast for the pictures. I like the fast one too- also, I love the quick shot of a cardboard container that says “food for thought!” seems like the opposite of that to me…. Although it’s interesting, the fast one makes me a bit dizzy 🙂 I’ll definetely be watching the slow one though! i like Mrs Q’s School Lunches (FAST) , it makes the point without losing my attention. I liked the fast one best. But holy cow, that was some disgusting looking food. I like the fast one. It’s fun to watch everything change so quickly. I like the fast one better because like you said it looks like they’re dancing and it just goes better with the beat of the music. I do like the slow one though because it gives you time to process the magnitude of the project and the close up pictures really stand out. I definitely prefer the fast video…it’s more “digestable” somehow…but man, either way it’s hard to believe you really did eat every one of those processed & unappetizing meals. pfiew! I prefer the slow one, I like to see the foods as the go by. I liked the fast one. As a school lunch director I have to say that most, if not all, of the foods you feature are either provided by the USDA Commodity program or approved as a use for processing of commodity foods to be used in Child Nutrition Programs. I always appreciate the “insight” into what we do and how we do it. I wonder if you have had a chance to meet with your districts’ food service dept. to discuss your findings. Thanks for your insight. Both! I love how the containers dance in the fast one, but the slow one really shows the public what school food looks like. I like the fast one. The slow one really makes me sad to see all the processed food for such a long time. The music went better with the slow one, tho. Thanks for sharing this new tool too! Oh my gosh, so much pizza! So many buns! I liked the fast one the best but it was dizzying both visually and just watching all that “stuff”! The fast one is fun and trippy…but the slow one allows you to better see what was on the tray. I preferred the slow one! I liked the fast one better. The slow one was too slow for me and I didn’t want to look that closely at the food again. I like the faster one because I’ve seen them before and they all look the same to me. Processed junk on a tray. 1 minute first, follower by the slower. Nauseating! Definitely the fast one! It fit with the music better. But I wonder what it would look like if you held a little longer on a handful of the more awful lunches, for emphasis? I think I prefer the slow one so I could really see the food. The short one went by so fast that I got fixated on all the packaging and waste, not the food itself. I like the fast one! It really makes all the TRASH on the tray stand out. No good! I also love the fast one! 🙂 And precisely because of those dancing containers. Wow that is alot of brown in the fast one! 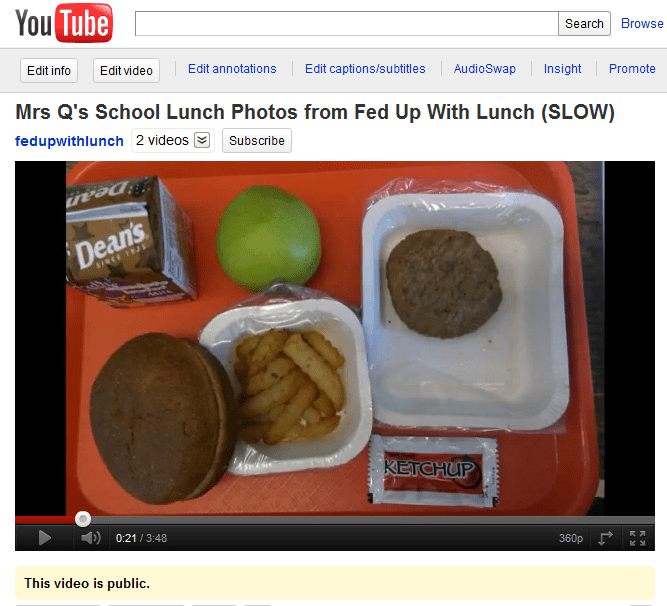 I’m struck by the amount of packaging, especially plastic, used in all those lunches. That’s just as ridiculous as the ingredient quality in some of those lunches. I like the dancing trays in the faster video! I liked them both but the faster one is my favorite. But the slower one really hit home on how many times you had certain things like fries or tots or the mystery greens. I miss school lunches on real trays. I like the fast one. I kept trying to find the same lunch over and over again – and did it. I was leaning toward the fast one at first, but I think my vote goes for the slow version if you are looking for an overall “oh-my-gosh” effect on the viewer. You get a chance to really see the foods, and while the fast one is fun, I think the slower one has more impact. I like the fast one because everything starts to look the same. I kind of like the slower one better because it is difficult to see what is in each photo in the faster one. The fast one. About half-way through the slow one, I got bored at the terrible sameness of the food. Ugh! the fast movie has better sense of how often food is repeated or the shear amount of packaging. I had a hard time watching the fast version! I liked the slow one better since I could distinguish the food better. Omg i love the fast one!!!! Love the book to!!!! I had some experiences like you!! !